Well met again, weary travellers, and welcome back to our series of articles showing you how journeys are handled in Against the Darkmaster! The first part was dedicated to travel planning and preparation, while in the second part we saw how journeys are played out and how heroes can deal with the Hazards they encounter while travelling. In this article, we will see what to do when the heroes need to take a little break during their adventures. Characters are assumed to camp and rest regularly while they travel. Normally this is part of their routine, so there’s no need to roll or pay particular attention to what they do when resting. However, in some occasions, they’ll need to find a safe spot to recover from their injuries and Conditions, or to hide from their foes. In these cases, characters can decide to set up a temporary Camp or to look for a Safe Haven. Travellers in dire need may try to set up a long term camp in the middle of the wilderness. This solution is usually avoided, save for desperate situations, as camps like these tend to attract unwelcome attentions and rarely stay safe for long. Once the characters have decided to set up a camp, one of them must take the lead, finding a safe and defensible camping spot and guiding the group to it. The others should describe how they are preparing, and what precautions they are taking to ensure the safety of their camp. Watching out for approaching enemies; tending to the horses; preparing meals or gathering wood to light a fire are examples of common activities for a group setting up a camp, but players are encouraged to be creative with their descriptions. Example: Alaise’s party is exhausted from crossing a difficult mountain pass as part of the last Hazard. Most of the characters suffer from the Weary condition, so they decide to find a place to camp and rest for a while. Alaise will take the leading role, while Garnaith Bolg will tend to Syndel’s wounds and Eydis will stand guard. The leading character must make a Wandering Skill Roll, with a Difficulty based on the size of the group (with elves, halflings and striders counting half a group member each), the type of terrain chosen, and the general dangerousness of the area. If no character is helping him with the camp preparations, this roll suffers an additional -20 penalty. Exposed Terrain represents places that offer little to no cover, like deserts or flatlands. Places that are inherently dangerous, like treacherous bogs or haunted ruins are considered Dangerous Areas. Darklands are places under the direct influence of the Darkmaster or his lieutenants. Every other terrain counts as Normal Terrain. Example (continued): Alaise’s party is composed by 4 characters. However one of them (Alaise) is a Strider, and another (Syndel) is an elf, so for the purpose of calculating the Difficulty of this Camping Roll, their group size is three. They’re crossing a windswept highland, with few places to hide their camp, that counts as an Exposed Terrain. The final Difficulty of Alaise’s Wandering roll will be -20. 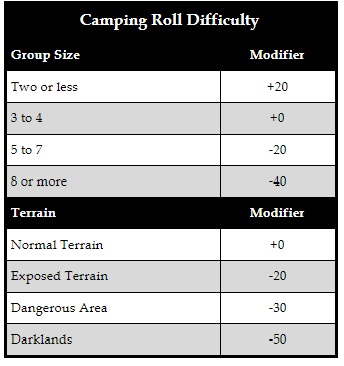 If this roll succeed, the party can safely rest for one day in their camp, but will have to make a new Wandering Skill Roll the next day. A Partial Success means that the heroes will be able to rest, but will also be plagued by some minor complication, possibly taxing their resources or slowing them down. For example, they could find that some of their rations rotted away; or that one of their pack beasts was injured during travel. In case of Failure, their rest will be interrupted by some kind of problem. The GM must choose or determine randomly one of the other characters, who’ll have to face a special Hazard based on the activity he was performing around the camp. predator or be startled by lightning and have to be calmed down; and so on. If no character was helping the lead with the camp, the party will be taken completely by surprise by the Hazard and suffer its consequences. Depending on how the character deals with this situation, the group could be forced to fight, flee or otherwise interrupt their rest. 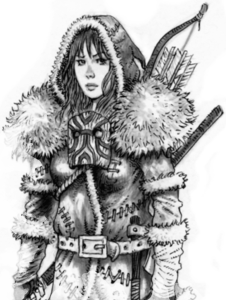 Example (continued): Alaise scored a Partial Success on her Wandering roll, so her party will be able to rest, but will encounter a minor complication. The GM tells Eydis’s player that she spots a group of vargr-riding redcaps, patrolling the road ahead. The patrol seems to be still oblivious to the heroes’ presence, but the group will have to be very careful the following days, if they want to avoid them. A much better option for characters seeking refuge would be heading to a Safe Haven. Safe Havens are beacon of light in the wilderness, houses of healing and bastions against the forces of the Darkmaster. They’re places where the heroes can rest without having to worry about their enemies, and tend to their wounds with the help of some of the greatest healers of the land. Characters resting in a Safe Haven halve their recovery time for Injuries and Conditions, and will recover double the normal amount of HPs. Safe Havens are also a great opportunity for characters to replace or repair broken pieces of equipment; meeting new friends and allies; researching informations or asking the locals for guidance on a difficult subject. 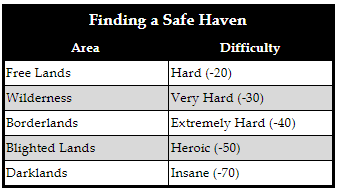 Unfortunately, Safe Havens are very rare and usually difficult to find. The Darkmaster sees them as a threat to his dominion, and would certainly send his armies to burn them to the ground, should he ever find them. For this reason, Safe Haves are hidden in secluded or inaccessible locations, concealed by magic, heavily guarded, or a combination of all of the above. So, unless the characters already know how to find it (either because they’ve been there, or because someone can guide them to their destination), reaching a Safe Haven won’t be easy. Heroes seeking a Safe Haven should make a Songs & Tales Skill Roll, with a Difficulty based on the influence of the Darkmaster in the area. Free Lands are civilized area whose inhabitants valiantly oppose the Darkmaster, and would almost certainly attack His minions on sight. Wilderness are large unclaimed or uninhabited regions, far from civilization but also free from the Darkmaster influence. Borderlands are those areas whose inhabitants neither directly oppose the Darkmaster, nor ally with Him; or Free Lands that border with Darklands or Blighted Lands. Blighted Lands are areas where the Darkmaster influence is strong and palpable; or accursed places that were forever tainted by terrible tragedies and heinous acts. Darklands are regions completely under the control of the Darkmaster and his minions. His strongholds, fortresses and the breeding grounds of His fell army. Example: A close encounter with a Darkwraith, one of the Darkmaster most fearsome servants, left Tobold in quite a bad shape. The poor halfling has been poisoned by the Darkwraith’s fell blade, and none of his companion is skilled enough to help him. In a desperate attempt to save her friend, Mornien struggles to recall the position of the nearest Safe Haven. A successful Roll means the character remembers a tale or legend describing the general location of a Safe Haven within 1d10 days of the party’s position. The group can then use the Trailblazing rules to reach it. A failure means the character got something wrong and either leads his party to an unforeseen obstacle, or to the ruins of an haven long fallen in disrepair or under the influence of Dark forces. 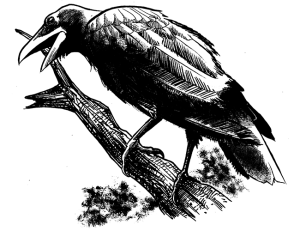 Example (continued): Luckily, Mornien’s roll is a Success, and she remembers a song about Béla the Skinchanger, a powerful Animist and fierce enemy of the Darkmaster, who lives all alone in these forsaken lands. She rolls 1d10 and gets a result of 3, meaning that a 3 days walk separates the party from Béla’s house. Once found, Safe Haven are marked on the world map by the GM, and characters will be able to visit them again without having to roll to find them. 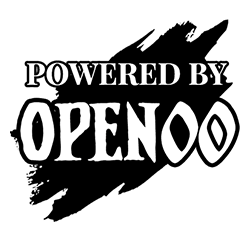 This is all for now, but remember that you’ll always find a Safe Haven in our G+ and Facebook communities, where we will be glad to answer all your questions and clarify your doubts about the game!